Release Date: February 23rd, 2007 by Picturehouse. The Cast: James McAvoy, Rebecca Hall, Dominic Cooper, Alice Eve, Charles Dance, Lindsay Duncan, Catherine Tate. BASIC PREMISE: Brian (McAvoy), a student at the University of Bristol, joins the school trivia team to get closer to a beautiful girl, Alice (Eve), while befriending Rebecca (Hall), a rebellious girl. Based on the novel by David Nicholls'. 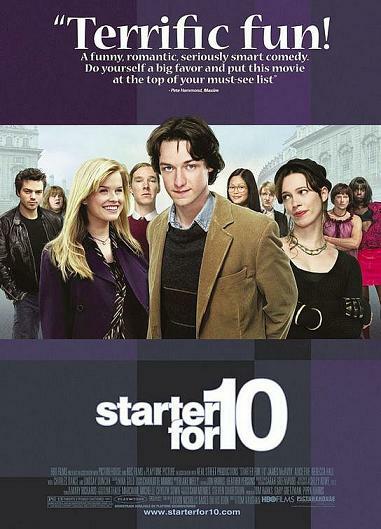 ENTERTAINMENT VALUE: Even though it often channels John Hughs’ films from the 80’s such as Some Kind of Wonderful, Starter for 10 has more misses than hits when it comes to mixing comedy, drama and romance. In the opening scene, Brian watches a trivia game show called University Challenge, a real show well known to the British. He enters the University of Bristol where he meets Rebecca, a sweet but rebellious girl who wants to be more than just his friend. Everything changes once Alice starts flirting with him in class and he helps her cheat on a test. Soon enough, he joins the school trivia team which competes for University Challenge, a competitive trivia game show on TV. The rest of the simple, by-the-number plot doesn’t get particularly exciting or refreshing, especially if you’ve seen other films with a guy meets a nice girl and a hot girl doesn’t realize the nice girl is right for him until that crucial scene in the third act. Unfortunately, Brian and the nice girl, Alice, don’t have enough scenes together to generate any real chemistry with each other. James McAvoy gives a decent performance as Brian and makes him reasonably likable and dorky without going over-the-top—he’s certainly not as memorable as Napoleon Dynamite, though. Screenwriter David Nicholls’ unimaginative script fails to include enough iconic, dry, British humor and wit as expected. Too many scenes end on an awkwardly abrupt note as if Nicholls just wants to rush to the predictable ending. On a positive note, director Tom Vaughan wisely includes a lively and diverse 80’s soundtrack which adds some much needed liveliness to make this a very light, yet forgettable romantic dramedy. SPIRITUAL VALUE: None, other than the importance of following your heart and not to allow yourself to be led to temptation and, thus, end up deceived. INSULT TO YOUR INTELLIGENCE: By-the-numbers and lacking in British humor and wit. IN A NUTSHELL: A lively soundtrack and a decent cast barely compensate for the unimaginative plot and a deficiency of British humor and wit.